An interview with Aniplex head Koichiro Natsume. He talks about music tie-ins, discusses how his own career in Sony Music Entertainment’s corporate department led to his being assigned to Aniplex (then SME Visual Works), and estimates the approval rate for projects pitched to Aniplex at 30-40 percent. Note, though, that this interview was conduced well before a conscious decision was made to cut down on the total number of anime being produced yearly, so the figure may well be lower now. 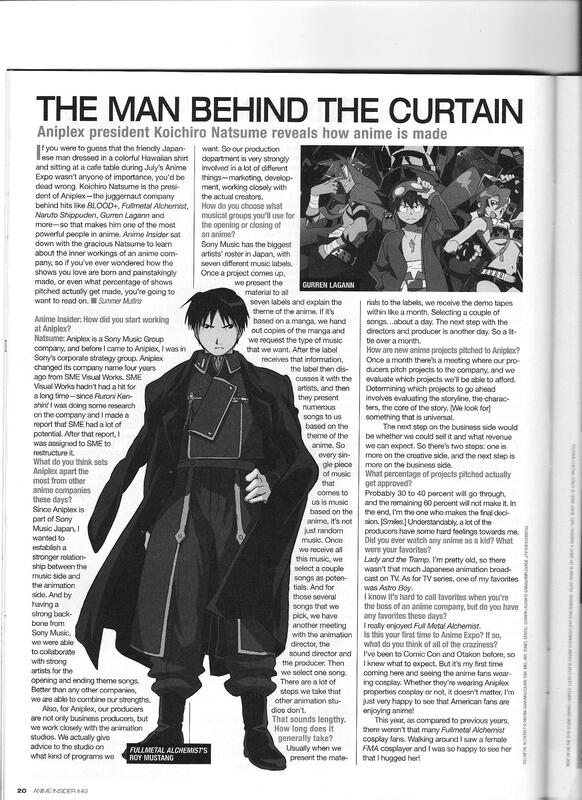 This entry was posted in Old Magazine Articles and tagged Anime, Aniplex, Borderline Plagarism for the Freedom of Information, Koichiro Natsume by torisunanohokori. Bookmark the permalink.